It's hard to say exactly what kept me from diving into this series for so long. It's been on my radar for simply ages and everyone who's anyone appears to love it dearly. I first became aware of Elizabeth Peters back in the Readerville days, and I did give the first book in her Vicky Bliss series a go awhile back, with fair to middling results. But the consensus does seem to be that the Amelia Peabody books are superior and that, given my love for all things historical and mysterious, I should have read them years ago. So when I saw a copy of Crocodile on the Sandbank just sitting there meekly on my local library's book sale shelf, I couldn't pass it up one more time. I confess to being a bit nervous, but quite excited, about what I might find inside. On a side note, I had absolutely no idea this book was first published in 1975. Of course, there are now something like 19 books and counting in this venerable series, so I should have guessed it started awhile back. Miss Amelia Peabody is a singular soul. The only daughter among scads of sons, she is the one who took care of their father at their country estate. While the boys were off living their lives, making their fortunes, Amelia was left at home with her father. And so it was to her he left his fortune upon his passing from this world. Shocked, Amelia decides it is high time to start living her life. Unabashedly intelligent and unreservedly blunt, she sets out putting her affairs in order and heading off on the adventure of a lifetime. Having always wanted to explore the antiquities of ancient Egypt, she sets off for that land. While on a break in Rome, she quite literally stumbles across a young woman on the brink of death. Nursing her back to health, Amelia determines the young, disinherited heiress Evelyn will make the perfect traveling companion and the two set off for Cairo. Once there, they make the acquaintance of the inimitable Emerson brothers. Quiet and affable Walter and irascible Radcliffe are excavating down the Nile and Amelia and Evelyn soon find their way to their camp. Unfortunately, they are unknowingly being tracked by a highly unusual enemy. And the four of them will have to combine forces in order to stay alive. This is a charming debut in what has become a very long-running and much beloved series. It's hard not to cotton onto Amelia right away. She's forthright to a fault and always speaks her mind. I found myself delighted with how little patience she has for stupid conventions and even stupider men. As it happens, Emerson has a similarly low tolerance for incompetence, though rather a low estimation of women. The two of them together are combustible and hilarious. I wish they had shared more scenes, though I'm aware this is just the beginning and several people have assured me it only gets better from here. And while it was a fun and quick read, it did lack some of the depth of character I've come to crave in my historical fiction. The secondary characters were quite spare, so I'm happy to hear things progress apace in future installments. Amelia's friendship with Evelyn does have its very sweet moments, particularly as Amelia has had very little contact with other women of her age. And her growing attachment to the stubborn Emerson certainly whets the reader's appetite for more. This is a light and witty Victorian adventure mystery and it made me laugh several times. I have hopes for the rest of the series and will definitely be picking up the second book in the near future. For those of you who've immersed yourselves in this series, which ones are your favorites? And do the storytelling and character arcs really hold up across so many books? I'm curious. I first heard of this series thanks to The Book Smugglers, and I've had it in my TBR pile for a while as a result. I need to give it a go! But WOW - 19 books?! I can feel my series starting engine shuddering in fear lol. This book has been in my TBR pile for some months now but so far I haven't felt like reading it. Maybe I will give it a try soon. "Every year, another dead body..."
I've read all of this series except for the most recent one (book 19, I think?). I love love love them all, as Amelia Peabody is my favorite female character of all time, replacing Emily Polifax due to Amelia's most excellent use of parasols and toolbelt! (Keep reading, you'll soon learn what I mean!) I LOVE the way that many of the books mingle Egyptian myths with the current mystery, and it is a total joy to watch the family expand and grow to include many new characters as the series goes on. I recommend this series as often as I can, and always envy people who are discovering it for the first time - I hope you continue and enjoy!! I'm so glad you finally started this series--it's one of my faves! Is the quality sustained across the entire arc of the series? No, but it holds up for many books, IMO. I started losing some interest when the focus began shifting more to the second generation. They're good characters, but tend to take themselves a little too seriously. Oh, and the first Vicky Bliss is really pretty bad, so don't take that as an indicator of the whole series. The second book is much better, and the series "really* picks up steam with the third one. The fifth, Night Train to Memphis, is one of my all-time favorite mysteries. I <3 Sir John! I'm glad you've read this one - it's the start of one of my all-time favourite series. And a definite yes to the storytelling and character arcs holding up (and getting better!) over the course of the series - this in many ways does read like an early book, and my favourites are hmm... the 10th and 11th, IIRC. Yay! You are in for such a treat as you get further into this series. My favourites are later in the series too - there is a four book arc that includes books 11 and 12 (from memory) that are just amazing! The later books are my favorites, actually, especially the ones set during World War I. I hope you get a chance to go on with the series. fun! i lurve the Vicky Bliss series for some of the same reasons - Vicky is an awesome, no-nonsense, ball of clever and wit. glad to hear you liked it! good luck with the rest of the series etc. I really enjoyed The Falcon at the Portal (which coincidentally was the first one that I read). I love Peabody and her parasol, but I have a giant soft spot for Ramses once he comes along. One of my favorite series - hope you continue on and grow to love them as much as I do! I liked Crocodile on the Sandbank and read the second book, and a couple of other random books in the series. It's not for me. I don't enjoy them. I am a huge Vicky Bliss fan (though I think you should start the series with Street of Five Moons and forget the first book) and I think Elizabeth Peters is a good writer. Trojan Gold and Night Train to Memphis are on my keep forever shelf. Angie, you really must give the Vicky Bliss series another chance. I also would have stopped at the first book if I hadn't purchased all five at once after reading Colleen Gleason's wonderful review of the series. I'm so glad I didn't. You will find that Deanna Raybourn's Silent in the Sanctuary pays homage to the fifth Bliss book, Night Train to Memphis (and if I'm wrong and that's just coincidence, it's a huge coincidence). I think you will love the hero of the series - he appears in Book 2. 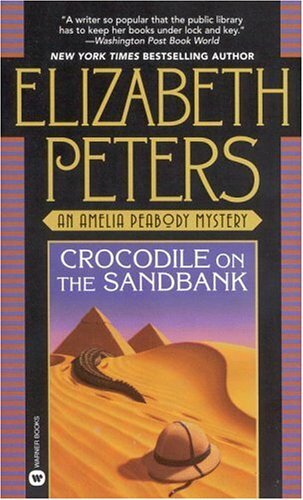 I read Crocodile on the Sandbank, but chose not to continue with the series. It's still on my radar since I'm such a fan of Elizabeth's other books, as well as her work as Barbara Michaels. I recommend Wings of the Falcon, which is written under her Barbara Michaels name. And Summer of the Dragon, which is a stand alone Peters book. Please let me know if you decide to try them out. For some reason I thought you'd already read Vicky Bliss and Wings of the Falcon, etc. I loved Crocodile on the Sandbank! This reminds me I need to write my review at some point. I ADORE this series. I've read... eight or nine of the books so far, and it's about time that I got back into them. Amelia is awesome, Emerson is swoon-worthy... I love everything about it. I loved this book! However, I got about halfway through the second an had to put it aside. Amelia annoyed me way too much! But then again, I was pregnant when I read it so that may or may not have had anything to do with it. ;-) She just seemed stupidly headstrong in the second one, and I felt like Emerson's character changed. But I'm probably the only one that thinks that, and I will have to try it again just to make sure. Hope you like the second one! I love her work as Barbara Michaels. Classics! I'm so glad you liked the book, it is a favorite of mine! I looove Amelia and Emerson. Seriously, after reading this book I made an effort to add "bellow" to my everyday vocabulary because the word never fails to crack me up when I think of Emerson. Anyway, as for the rest of the series...you just wait. One word: Ramses. Not THE Ramses...but the child Ramses. Hands down my favorite character of the series. (He comes in at the start of the second book, so I'm not spoiling anything!) As he grows up, he becomes even more awesome, and then in uh...I *think* its The Last Camel Died at Noon, another regular character is added that also adds a lot to the series. Anyway, I hope you keep reading them and I can't wait to see what you think!